I loved The Maze Runner. I come from a non-reader perspective of the film adaptations of James Dashner’s trilogy of young adult novels. I was surprised at the thrill and enjoyment of watching Thomas (Dylan O’Brien) and his fellow Gladers find their way out of the maze and learning the truth about WCKD’s deception. Still a non-reader, I was excited to see if the second film, Maze Runner: The Scorch Trials, could live up to the first. This is one of the few young adult series that made it past the first film in a planned series of multiple films. The Scorch Trials continues with where The Maze Runner left off. To put the audience back in the mindset of the story, there are two scenes that precede the continuation: one that is from The Maze Runner and one that shows how Thomas came to be part of WCKD. After that, the film hits the ground running, beginning with the Gladers’ (Thomas, Minho (Ki Hong Lee), Teresa (Kaya Scodelario), Newt (Thomas Brodie-Sangster), Frypan (Dexter Darden), and Winston (Alexander Flores) arrival at a compound led by Janson (Aidan Gillen, Game of Thrones). To the surprise of the Gladers, they are not alone in their experience as they meet other teens from similar circumstances. Of course, not everything is as it seems and they find out that the compound is run by WCKD and what they plan to do with them. 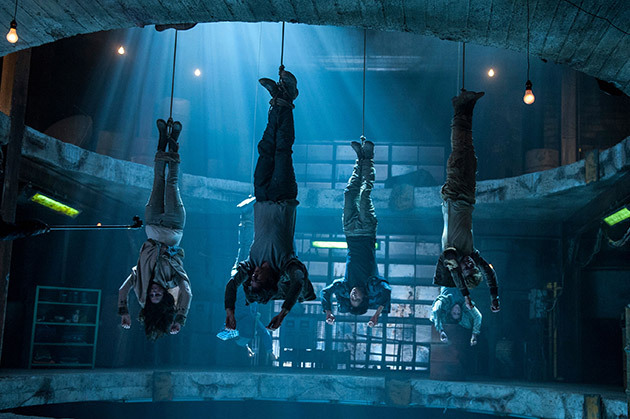 The Gladers promptly devise and execute a plan to escape with new friend Aris (Jacob Lofland) in tow. What follows is a scene of desolation and sand that follows the Gladers until the end of the film. The Scorch Trials is very much like The Two Towers of The Lord of the Rings trilogy. It has a beginning and an end point and quite a bit happens in between. The film is constantly switching settings and predicaments which is a drastic change from The Maze Runner which was rooted in one place. The Gladers are looking for The Right Arm, which is basically the only meaningful resistance movement against WCKD. Due to this end goal, the Gladers are in a constant search for them while running from WCKD. 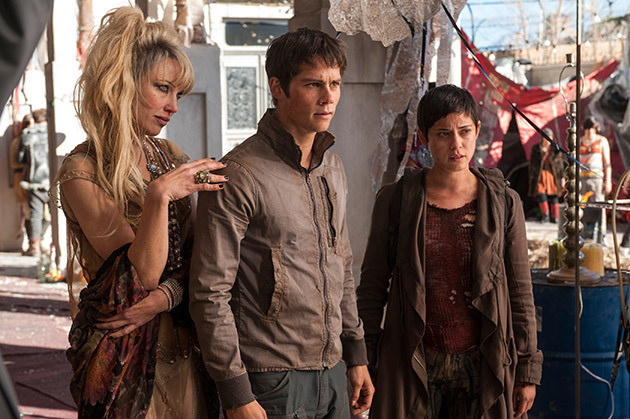 The Gladers are not only running from WCKD, but also have encounters with a couple different infected humans. The Scorch Trials enters the realm of zombie flicks with their infected population, basically what caused the downfall of society. Another zombie creature with some fungus-like attributes joins the basic zombies to put a little pep in the step of the Gladers as they travel. While they run and search, the Gladers encounter a number of new supporting characters. It brought a smile to my face every time a recognizable actor popped on screen. They include Lili Taylor, Giancarlo Esposito, Nathalie Emmanuel, and others that the trailers do not spoil. I am pretty sure they shot this during a Game of Thrones hiatus. Patricia Clarkson returns as Ava Paige, the head of WCKD, and she continues to be subtlety evil. Wes Ball continued with the director’s chair for the second film in the series, taking on a film with a greater scope and more action, or at least a different type. T.S. Nowlin continued with screenwriting the second film. Having not read the book or the third book, The Death Cure, I wonder how much content had to be forced into the film. It feels like too much is happening and at a rapid pace. The film is also longer than the first, and it is noticeable. In my opinion, the film could have ended 20 minutes earlier, but the audience is thrust into another action-packed sequence that drags. The Scorch Trials is not as good as The Maze Runner, but its settings, characters, and obstacles make it a much more complex film. Just be aware that this film will probably not impress you as much as the first. I am still anxious to see the conclusion of this series, and I have no doubt the film will make the box office money to make it happen. If anything, I hope this film accomplishes setting the scene for a takedown of WCKD and the salvation of the world of The Scorch Trials.